This post comes from John Piper at Desiring God. 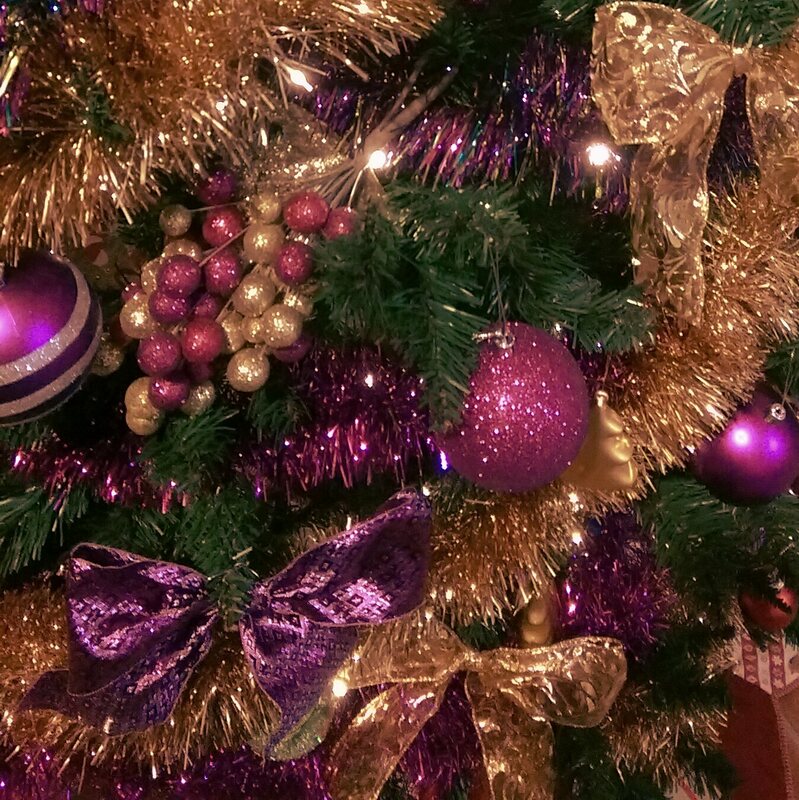 It is a really helpful explanation of the reason for the season. The term “children” is taken from the previous verse and refers to the spiritual offspring of Christ, the Messiah (see Isaiah 8:18; 53:10). These are also the “children of God.” In other words, in sending Christ, God has the salvation of his “children” specially in view. It is true that “God so loved the world, that he sent [Jesus].” But it is also true that God was especially “gathering the children of God who are scattered abroad” (John 11:52). God’s design was to offer Christ to the world, and to effect the salvation of his “children” (see 1 Timothy 4:10). You may experience adoption by receiving Christ (John 1:12). The reason he became man was to die. As God, he could not die for sinners. But as man he could. His aim was to die. Therefore he had to be born human. He was born to die. Good Friday is the reason for Christmas. This is what needs to be said today about the meaning of Christmas. In dying, Christ de-fanged the devil. How? By covering all our sin. This means that Satan has no legitimate grounds to accuse us before God. “Who shall bring any charge against God’s elect, it is God who justifies” (Romans 8:33) — on what grounds does he justify? Through the blood of Jesus (Romans 5:9). If we do not need to fear our last and greatest enemy, death, then we do not need to fear anything. We can be free. Free for joy. Free for others. 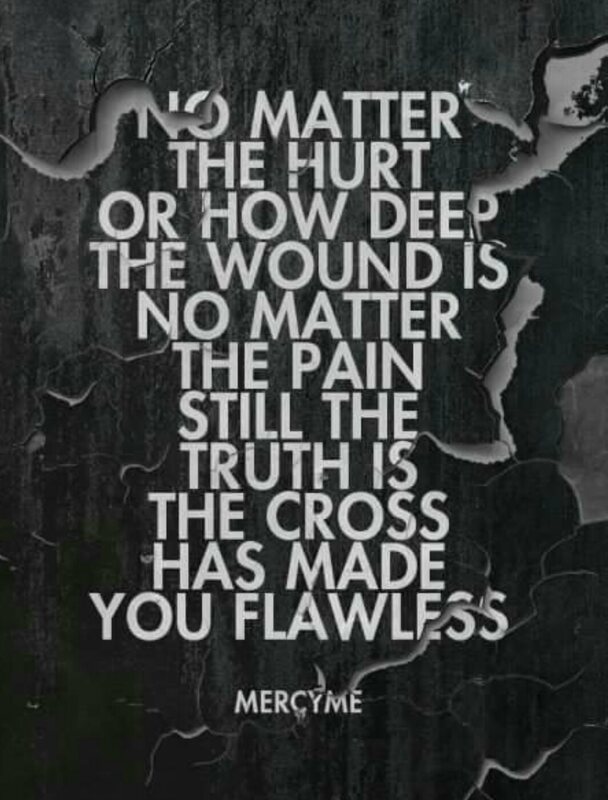 One of my most popular and most discussed posts concerns the Mercy Me song ‘Flawless’ – with the statement ‘the Cross has made you flawless’. You can remind yourself of the song here. Today I’m sharing a post from John Piper which explains the certainty of our salvation in Christ. This salvation is not flawed – though we most certainly are. But the question remains: Has Christ truly perfected us for all time? Now? Two things here are mightily encouraging for us in our imperfect condition as saved sinners. First, notice that Christ has perfected his people, and it is already complete. “For by one offering he has perfected for all time those who are being sanctified.” He has done it. And he has done it for all time. The perfecting of his people is complete and it is complete forever. Does this mean that Christians don’t sin? Don’t get sick? Don’t make mathematical errors in school? That we are already perfect in our behavior and attitudes? There is one clear reason in this very verse for knowing that is not the case. What is it? It’s the last phrase. Who are the people that have been perfected for all time? It is those who “are being sanctified.” The ongoing continuous action of the Greek present tense is important. “Those who are beingsanctified” are not yet fully sanctified in the sense of committing no more sin. Otherwise, they would not need to go on being sanctified. In What Way Are We Perfect? So here we have the shocking combination: The very people who “have been perfected” are the ones who “are being sanctified.” We can also think back to chapters 5 and 6 to recall that these Christians are anything but perfect. For example, in Hebrews 5:11 he says, “You have become dull of hearing.” So we may safely say that “perfected” inHebrews 10:14 does not mean that we are sinlessly perfect in this life. Well, what does it mean? The answer is given in the next verses (Hebrews 10:15–18). The writer explains what he means by quoting Jeremiah on the new covenant, namely, that in the new covenant which Christ has sealed by his blood, there is total forgiveness for all our sins. Verses 17–18: “Their sins and their lawless deeds I will remember no more. Now where there is forgiveness of these things, there is no longer any offering for sin.” So he explains the present perfection in terms (at least) of forgiveness. Christ’s people are perfected now in the sense that God puts away all our sins (Hebrews 9:26), forgives them, and never brings them to mind again as a ground of condemnation. In this sense, we stand before him perfected. When he looks on us, he does not impute any of our sins to us — past, present, or future. He does not count our sins against us. You may have assurance of your perfect standing with God because by faith in God’s promises, you are moving away from your lingering imperfections toward more and more holiness. Our remaining imperfection is not a sign of our disqualification, but a mark of all whom God “has perfected for all time” — if we are in the process of “being changed” (2 Corinthians 3:18). So take heart. Fix your eyes on the once-for-all, perfecting work of Christ. And set your face against all known sin. I found each of these short Christmas devotions really encouraging. You will easily find a place to share them in your home, your church, your classroom or your facebook wall this Christmas! 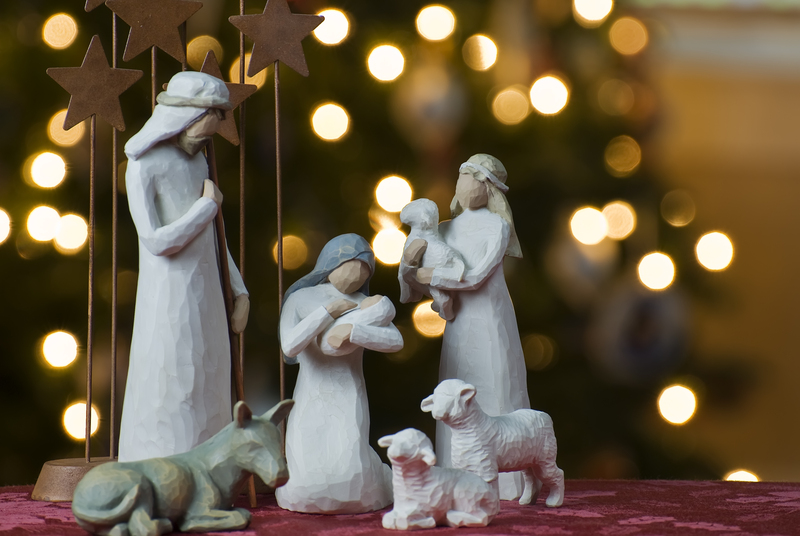 Now you would think that if God so rules the world as to use an empire-wide census to bring Mary and Joseph to Bethlehem, he surely could have seen to it that a room was available in the inn. Yes, he could have. And Jesus could have been born into a wealthy family. He could have turned stone into bread in the wilderness. He could have called 10,000 angels to his aid in Gethsemane. He could have come down from the cross and saved himself. The question is not what God could do, but what he willed to do. God’s will was that though Christ was rich, yet for your sake he became poor. The “No Vacancy” signs over all the motels in Bethlehem were for your sake. “For your sake he became poor.” God rules all things—even motel capacities—for the sake of his children. The Calvary road begins with a “No Vacancy” sign in Bethlehem and ends with the spitting and scoffing and the cross in Jerusalem. The angel said to Zechariah: “Fear not!” He said it to Mary: “Fear not!” And now he says it to the shepherds: “Fear not!” It’s a natural thing for a sinner to fear. The more guilt we have, the more things we fear: fear of being found out for some little deceit, fear that some ache we have is God’s judgment, fear of dying and meeting the holy God face to face. And in the place of fear Jesus puts joy. Joyless faith in Jesus is a contradiction in terms. Paul summed up the goal of his whole ministry like this: “for the advancement and joy of your faith.” And he told the Philippians and Thessalonians, “Rejoice always, and again I will say rejoice.” Always? Yes. Not without tears of grief and pain. But still joyful. When my mother was killed, I cried for about half an hour before I could stop. But as I knelt there by my bed, I was not only grieving. I was hoping. And while it is very hard to describe, there was a kind of joy in God and his sovereign goodness that later on at her funeral I tried to express. So don’t oversimplify: it is not wrong to cry (weep with those who weep), but there is a joy rooted in God’s rule of love that is never overcome in God’s children. “This is the judgment,” Jesus said, “that the light has come into the world and men loved darkness rather than the light because their deeds are evil.” Or as the aged Simeon said when he saw the child Jesus: “Behold this child is set for the fall and rising of many in Israel and for a sign that is spoken against . . . that the thoughts of many hearts may be revealed.” O, how many there are who look out on a bleak and chilly Christmas day and see no more than that. He came to his own and his own received him not, but to as many as received him to them gave he power to become the sons of God, to as many as believed on his name. It was only to his disciples that Jesus said, “Peace I leave with you. My peace I give to you; not as the world gives do I give to you. Let not your heart be troubled, neither let it be afraid.” The people who enjoy the peace of God that surpasses all understanding are those who in everything by prayer and supplication let their requests be made known to God. The key that unlocks the treasure chest of God’s peace is faith in the promises of God. So Paul prays: “May the God of hope fill you with all joy and peace in believing“. And when we do trust the promises of God and have joy and peace and love, then God is glorified. Glory to God in the highest, and on earth peace to men with whom he is pleased: men who would believe. In him was life, and the life was the light of men. The light shines in the darkness, and the darkness has not overcome it. There was a man sent from God whose name was John. He came for testimony, to bear witness to the light that all might believe through him. If you are ever granted to see that light for what it really is, you will believe it. Everybody who knows the light is like John the Baptist: we have seen the light and testify to it. We have been lifted out of the dark caverns of our sin and guilt and fear into the bright daylight of his grace. How can we help but spread the light? To symbolize the coming of the light into our dark world and the spreading of the light through the world we will spread the flame of the Christ candle through the room. 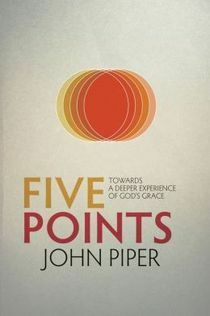 If you are looking for a little book to read for some encouragement in understanding the grace of God, Pipers “Five Points” will probably fit the bill. In less than a hundred pages you can plumb the depths of the irresistible grace of God, in a journey through the Five Points of Calvinism, on which the book is based. Along with Martin Luther, John Calvin was the most influential writer in the Protestant Reformation. If you have never considered the building blocks of our Protestant faith, head over to Piper’s site for the free PDF.